Unfortunately, the funge part of the dish was a little less successful; we both thought it was pretty tasteless (shouldn’t be surprised, really, given the ingredients) and the consistency was a little weird. However, this may be partially our fault. Since we substituted potatoes for the chicken, our dish actually had two starches: the funge and the potato. This was really a bit much, but I think that if you went with the chicken version of the dish, the funge would be a lot more palatable. Anyone out there enjoy funge? Let us know if we missed any tricks; we were trying to be as true to the recipe as possible! 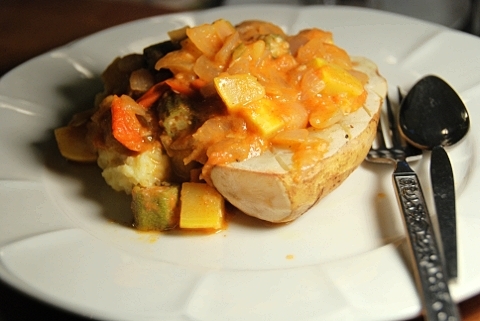 Preheat your oven to 425, and slice the potatoes in half lengthwise. Score the flesh of the potatoes with a knife, place them on a baking sheet, and drizzle some olive oil over each half, making sure that some oil gets down into the cuts you’ve made. Sprinkle with salt and pepper. Cover loosely with some foil to avoid drying out, and when the oven is ready, put in the potatoes. 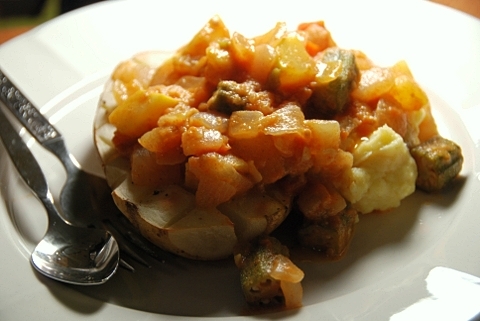 Cook for about 30-45 minutes, checking intermittently, until the flesh is soft and the potatoes are cooked through. Add a couple tablespoons of olive (or canola) oil to a large pot, and heat up over medium-high heat. Add the onions and cook for 5-7 minutes, until they start becoming translucent. Then add the garlic, jalapeño, and tomato. Don’t worry if the pieces of tomato look way too big. They will end up becoming kind of mush-like, and distributing themselves fairly evenly in the dish (sounds appetizing, right? 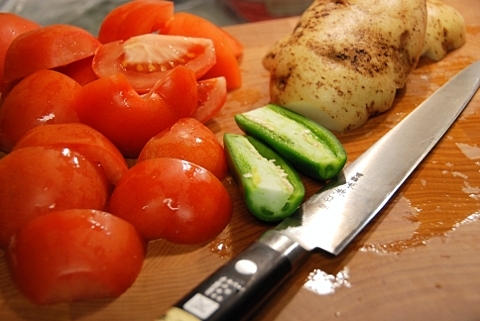 ), so I promise you will not end up with giant chunks of tomato in the final thing! 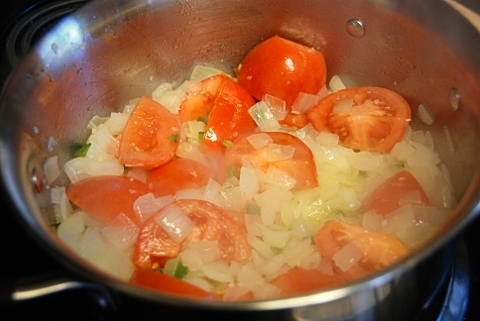 Cook this for about 10-15 minutes, stirring intermittently, until the tomatoes have started doing their dissolving thing. 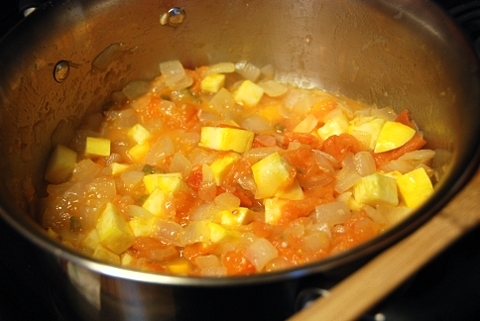 Then add the squash, and cook for another 5 minutes or so. At this point, add the okra and water/veg stock. 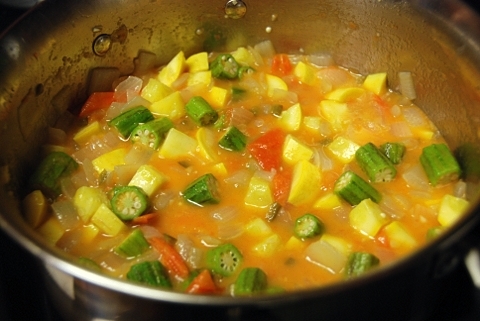 Cook until the okra is tender, and then season with salt and pepper to your tastes. This is crazy easy. Boil some water. I think we ended up using about a cup? When it is boiling, begin adding corn flour while stirring. The original recipe described the result as a “paste” — I think we ended up going for a texture or thickness similar to mashed potatoes. I’m not sure how much corn flour we added, but just keep adding it until you get the consistency you want! It’s hard to see in our final pictures, and we didn’t take any photos of the process because it was so simple, but you’ll know it when you see it. Enjoy, and again, let us know if you have a preferred way of cooking funge that is different from the way we did it here! You are currently reading Muamba de Galinha + Funge (Angola) at Nombudsman.